Home/ All Custom Orders/ Shirt/Tie/Hanky Sets With FREE Cufflinks/ Avanti Uomo Blue Circle Pattern French Cuff 100% Cotton Shirt / Tie / Hanky Set With Free Cufflinks DN68M. "This shirt/tie/hanky set is provided from an in-stock selection provided by manufacturer. Prior to shipping this shirt/tie/hanky set to you, we will inspect the shirt/tie/hanky set for quality purpose. Please, allow an additional 7-9 business days in order to receive your shirt/tie/hanky." 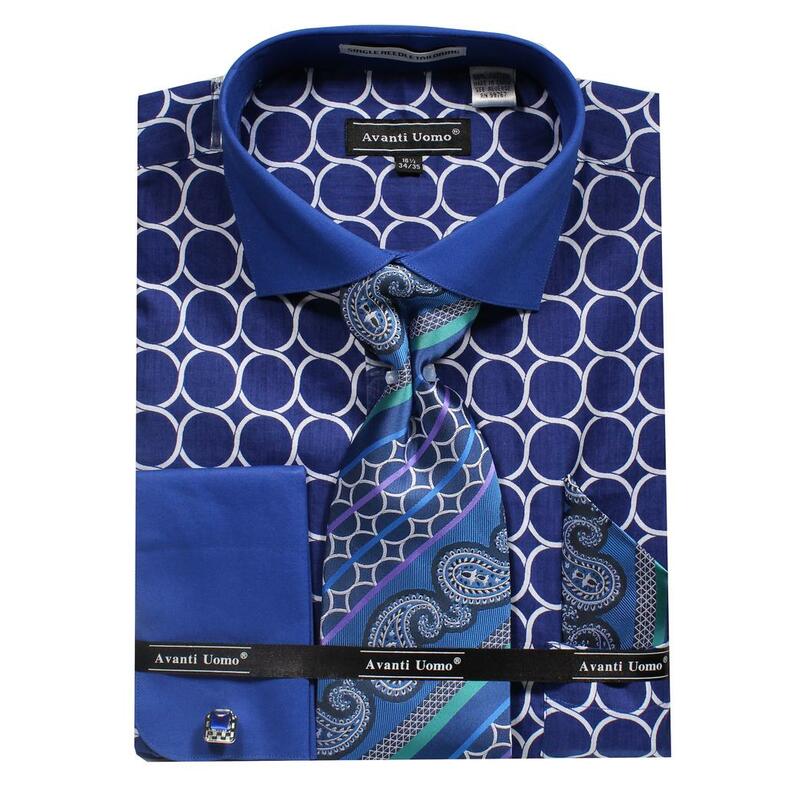 Trend setting designing shows with this exclusive Avanti Uomo dress shirt/tie/hanky set. It offers a woven 100% cotton in a unique design . It has French cuffs and features single needle tailoring with silk threading. It is also designed with a spread collar and is designed in Italy with a European cut. This translate to a nice tailored fitting that will look nice with any high-end Italian suit. Sleeves are standard Italian lengths that can be altered down if desired. It also comes with a beautiful matching woven silk tie / hanky set that will set this shirt off! This shirt/tie/hanky set designed for the guy who wants to stand out but does not get pointed at.